Barchart Trader is a premier market data and trading platform built with professional features and data, as well as ease-of-use for traders. Barchart Trader ensures flexibility with its customization features, multiple monitor support, choice of themes and wide range of features. With Trader's integrated futures trading you can route orders directly through Tru Trading and use features like DOM, Chart Trader, or Trading from the Quote Board. With direct connectivity to dozens of exchanges you have access to ultra low-latency real-time streaming market data across stocks, futures/commodities, indices, funds, and forex. With an interactive charting tool that offers advanced features you can easily switch between different chart types, change time periods and add from over 70 technical studies with a dozen drawing tools. The DOM trader gives you the ability to trade directly from the order book. You can place market orders, limit orders and stops while monitoring for volume traded at various price levels. Chart Trader gives you the ability to directly trade futures from your charts. You can monitor positions and P&L as the market updates in real-time, as well as place market, limit and stop orders. Instant installation: You will be up and running in just seconds. Mobile Apps: Trade on your Anroid or iOS phone or tablet with ease. 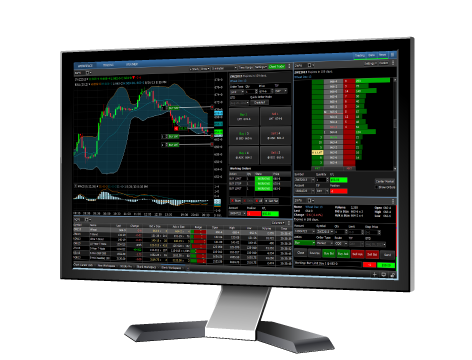 Multiple Monitor Support: View Quotes, Charts, and News from 2 or more screens. Chart Trader: Place orders and monitor P&L direct from your charts. Overlay Charts: Compare other symbols by price or percent change. Market Data: Tick, minute or end-of-day data whenever you need it. Workspace Templates: Access dozens of pre-configured templates. Customize Workspaces: Easily design your own workspaces for a custom experience. Spreads: Both Exchange Traded Spreads and a theoretical Spread Matrix are provided. Filter by type such as Calendar or Butterflies and scan for developing spread patterns. Options: Includes filters to monitor all strikes or limit to those at and near the money.